There is so much talk about the need for judicial restraint. Politicians (especially Senators during the Supreme Court confirmation process), commentators, and some Justices themselves, speak about it passionately, religiously, robotically. You know: judicial restraint good; activist judges bad. The dichotomy is largely nonsense. It is also an extremely poor proxy for what the restraint partisans actually do and don't want from judges. A major tenet of judicial restraint, if not the major tenet, is that judges should defer to the choices of the other branches and of the states. Judges should uphold the laws enacted by the Congress and the states, unless those enactments clearly violate the Constitution. Judges should not invalidate the choices of those more democratic, majoritarian, more-accountable-to-the-people, and closer-to-the-people arms of the government. The duly enacted laws of Congress and the states should be left alone by the judiciary, unless they are unconstitutional beyond a reasonable doubt. In short, as my mentor would say, borrowing from Al Smith, "It depends on whose ox is being gored." 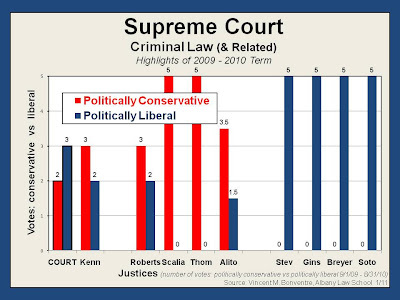 Liberal Justices are more likely to be "activist" in voting to invalidate conservative-favored laws. Conservative Justices are more likely to be activist in voting to invalidate liberal-favored laws. Really, any surprise there? So what about last term? Specifically, for now, regarding the criminal law and related cases? Just how restrained were each of the Justices--i.e., how often did they respect the choices of the Congress and the states and vote to uphold what they enacted? And just how activist were each of them--i.e., how often did they vote to invalidate what Congress and the states had done? Let's see. 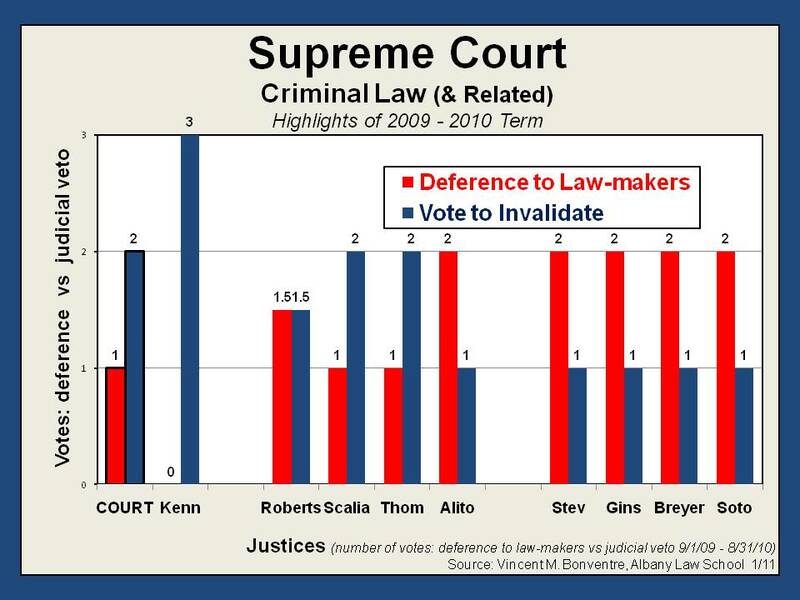 As depicted in Graph 1, the liberal Justices, as a group, deferred to the lawmakers more than the conservatives. Stated otherwise, the conservative Justices, again as a group, voted to invalidate what laws enacted by Congress or the states more than did the liberals. 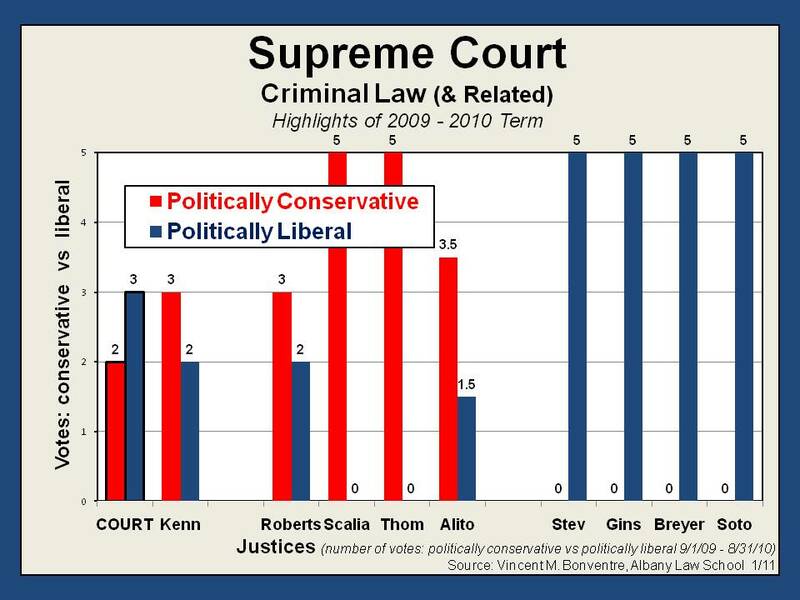 In short, the liberal Justices, as a group, were more restrained than were the conservative Justices, as a group. Yes, this is a small sample. There were 5 criminal law and related cases out of the 10 highlights, and only 3 of those involved an issue of whether or not to defer to the choices enacted by lawmakers. There was Graham (involving the validity of a law providing for a life sentence without parole for a crime committed by a juvenile), Skilling ("honest services" fraud law), and McDonald (gun control laws). As a group, the liberal Justices voted to defer to the lawmakers by upholding the federal white collar criminal law of "honest services" fraud and state gun control laws. They voted to invalidate the state law imposing a life sentence without parole for a juvenile crime. As a group--with, however, some differences among them--the conservative Justices voted the reverse. Interestingly, Justice Kennedy, the swing voter, refused to defer to the lawmakers every one of the 3 cases. But yes, that's only 3 cases. In the next post we'll take a look at the very same thing over all the highlights--not just the criminal law cases. 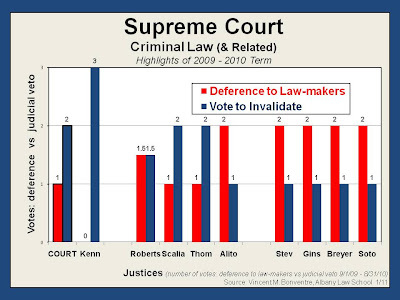 For now, though, lets look at the voting in the 5 criminal law and related cases a bit differently. For now, let's forget about pro-government versus pro-individual, pro-change versus pro-status-quo, and judicial restraint (defer to the lawmakers) versus activism (invalidate what the lawmakers enacted). Let's simply look at how conservative Republican politicians would generally vote, and how liberal Democratic politicians would. Let's see how the Justices line up on that partisan divide. Again, forgetting all the nonsense about which Justices are judicial activists and which are restrained. Let's see. Ah, how utterly surprising! The 4 liberal Justices on the Court voted precisely how liberal Democrats would generally vote in all of the 5 criminal cases. For the right to counsel in the immigrant case (Padilla), for the "honest services" law (Skilling), and for gun control laws (McDonald); but against life sentence without parole for juvenile crimes (Graham), and against interrogations unless the suspect explicitly waives his Miranda rights (Thompkins). And the 2 most conservative Justices, Scalia and Thomas voted exactly the opposite in every case--i.e., like conservative Republican politicians in every case. Chief Justice Roberts and Justice Alito were not so politically one-sided. Roberts split the difference in 2 cases (on the right to counsel and the life sentence). Alito did so in one of them (on the right to counsel). They both voted with the liberals in one case (to save the "honest services" law). These are the records in only the criminal law and related cases. But they are certainly revealing. What they tell cannot be dismissed, despite the small sample. No, not when 6 out of the 9 Justices behave precisely how we might expect if we considered absolutely nothing but partisan political positions. In each of 5 close cases--yes, let's be candid and objective, they are very close cases--6 out of the 9 Justices just happened to take the very same positions that we would expect them to take if they were voting as politicians. Nevertheless, we should look at the Justices' records over the entire "Top Ten" highlights. That's a sample twice the size. We'll see if the same patterns emerge. We'll see if those patterns persist when we look at all the cases: free speech and related, church and state, and criminal law and related. We'll do that in the next post in this series.